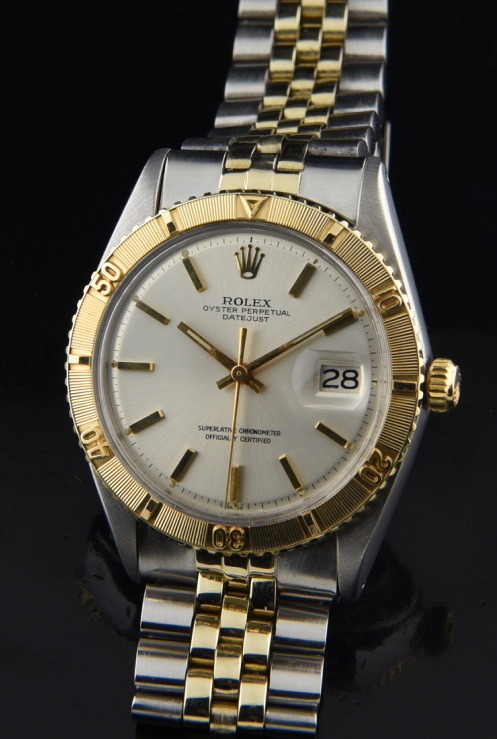 This 1968 vintage ROLEX DATEJUST THUNDERBIRD is a gem! The 36mm. ROLEX OYSTER steel case with solid gold THUNDERBIRD (crisp) turning bezel really looks quite fine and near pristine. The silver “pie pan” style dial with gold baton markers and hands looks fantastic. The USA ROLEX Jubilee 14k. gold and steel bracelet has the usual stretch for its age and looks excellent. This ROLEX will fit up to an 8 inch wrist. The automatic winding ROLEX movement was just cleaned and is accurately keeping time. These vintage THUNDERBIRDS are undervalued in my opinion. This is a great example!